Statements of Priorities (SoP) are the formal funding and monitoring agreement between Victorian public hospitals services and the Secretary for Health and Human Services. Agreements are in accordance with section 26 of the Health Services Act 1988. Statements of Priorities are consistent with the health services’ strategic plans and aligned to government policy directions and priorities. The annual agreements facilitate delivery of or substantial progress towards the key shared objectives of financial viability, improved access and quality of service provision. 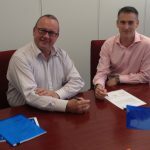 Heathcote Health Board Chair, Mr Wayne McKay and Mr Adam Horsburgh from the Department of Health & Human Services Regional Office signed the agreement on Thursday 13th October 2016. Click here to read the signed agreement.